Solid NEMA Color Cards are a bright way to mark wires. Wire Marker cards come in packs of 10 cards, so that you always have one when you need one. NEMA Cards are easy to carry and easier to use: simply peel off a sticker and apply. The strong adhesive backing will ensure that markers stick on. • Made from cotton cloth impregnated with vinyl, the acrylic fabric is coated with permanent pressure sensitive rubber based adhesive. • Markers are conformable for layovers and grooves. 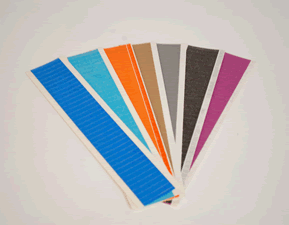 Rubber based adhesive sticks even to bumpy or curved surfaces. • Markers contain polyester strands, which give it strength. Markers are screen printed for extra durability.